1st Sunday of every Month SOUND HEALING AND YOGA WITH LEA GARNIER at SAGE, 6 Deming St. Woodstock, N.Y.
Sound healing and yoga is an ongoing monthly yoga class which merges gentle asana sequences, pranayama or attention to breath and sacred sound to relax and unite our emotional, spiritual and physical bodies. Also known as Nada Yoga or union through sound, it is the ancient spiritual art and science of inner transformation through sound and tone. Meditation on sound is one universal path to Self Realization, accessible to anyone, and appropriate for people of any religion or spiritual aspiration. Aligning through yoga is a path of balance and healing or to be whole, which strives to be in balance with all that is. Sometimes we become heavy or stagnant and we need to cultivate a greater degree of space in our body temple. Learning to focus your practice on the breath, sacred sound and asana will leave you feeling fully resonant from the physical to the subtlest layers of the body. This class is appropriate for all levels of yogis from beginner to advanced. Sacred sound instruments vary with each class depending on the group or individual needs. Different instruments have different qualities. 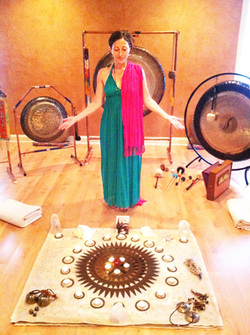 The gong’s deep voice has a clearing or washing effect. The high pitches of tuning forks, combined across specific tonal intervals are believed to cause cellular changes. Crystal bowls generate an ethereal sound said to stimulate access to intuitive knowledge. Vocal toning and Mantra along with instruments created from nature can adjust imbalance of the spirit, and can resonate our energy centers or chakras.